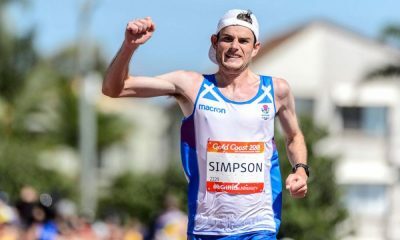 Kyle Langford won silver in the men’s 800m as Sophie Hahn took gold, and Eilidh Doyle, Dina Asher-Smith and Leon Reid also came away with medals at the Commonwealth Games on Thursday (April 12). On an eventful fifth day of athletics at the Carrara Stadium Track, the home nations sprinters experienced both joy and heartbreak. 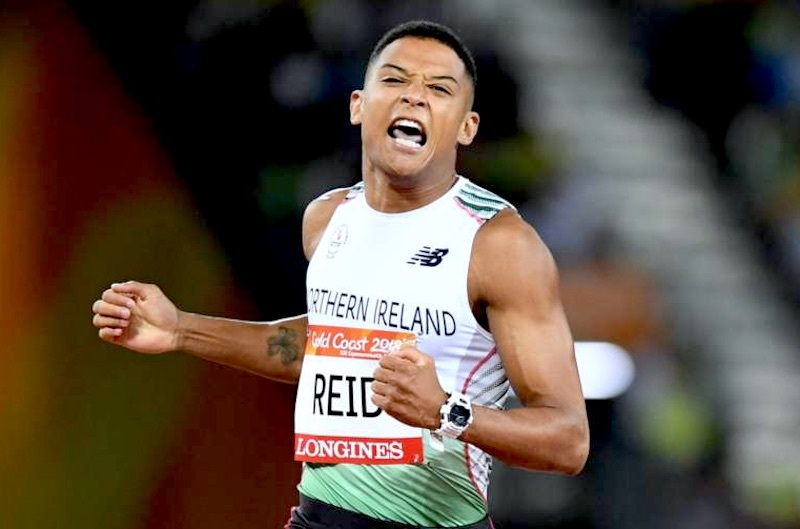 Dina Asher-Smith took bronze in the women’s 200m before England team-mate Zharnel Hughes appeared to take victory in the men’s event only to be disqualified, with Northern Ireland’s Leon Reid promoted to bronze. 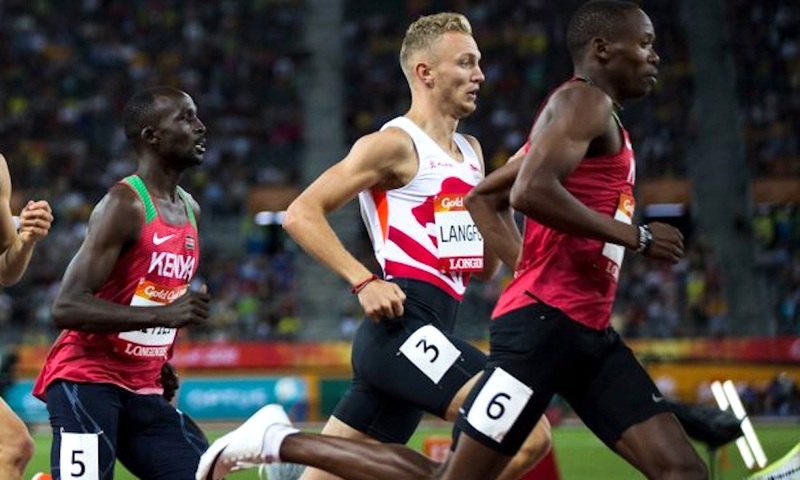 For Langford, gold was in his sights as he rapidly closed on the eventual winner, Wycliffe Kinyamal of Kenya, down the home straight but, although his 1:45.16 was a personal best, he was ultimately five hundredths adrift. After a slow first 400m, the race picked up in the back straight as Kinyamal and pre-race favourite Nijel Amos led with 200m to go. Still fifth and a second behind Kimyamal with 100m left, Langford then slowed less than his rivals, although he arguably left his charge too late. 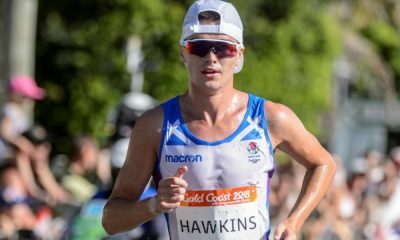 The 22-year-old, who was fourth in the world final last year, was followed home by Australia’s Luke Mathews, who ran 1:45.60 to just beat Scotland’s Jake Wightman (1:45.82) for bronze. Running in a field which would not have looked out of place in a world or Olympic final, Asher-Smith finished behind the dominant Bahamian Shanae Miller-Uibo (22.09) and Jamaica’s Shericka Jackson (22.18). Asher-Smith, who just pipped Olympic 100m and 200m champion Elaine Thompson of Jamaica, ran 22.29 – her fifth fastest ever time. England’s Bianca Williams was sixth in 23.06. Moments later England team-mate Hughes formed a big lead in the first 150m of the men’s half-lap. However, Trinidad & Tobago’s Jereem Richards quickly closed him down and applied enough pressure that Hughes began to lose form in the dying metres. The pair clashed arms and, although Hughes was given the win initially, 20.12 to 20.14, the England team knew they had a nervous wait for a potential protest. As feared, Hughes was disqualified for stepping out of his lane and impeding another athlete. 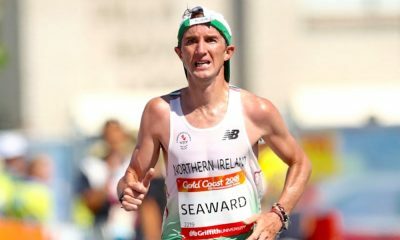 Canada’s Aaron Brown thus took silver in 20.34, meaning Northern Ireland’s Reid, who features on Fast Running in the class of 2018, was elevated to bronze in 20.55, winning the nations first Commonwealth medal in 28 years. “I had a little cry,” he said afterwards. “I’m very excited. I’m going to find my Mum and celebrate tonight. Scotland’s Eilidh Doyle took silver in the 400m hurdles for the third Commonwealths in succession. While Jamaica’s Janieve Russell always looked the winner, stopping the clock on 54.33, Doyle finished strongly to win a close tussle for the minor medals in 54.80 – her fastest in these Games. Crossing the line 0.16 seconds ahead of South Africa’s bronze medallist Wenda Nel, she claimed her 16th medal at European, Commonwealth or world level. Hahn was just two hundredths outside her world record as she won the 100m T38 for athletes with cerebral palsy. Her 12.46 was a Games record as she beat Australia’s Rhiannon Clarke (13.17) and Wales’ Olivia Breen (13.35). England’s Katrina Hart was sixth in 14.82. English hurdler Jack Green was satisfied with his fourth in the corresponding men’s 400m hurdles. 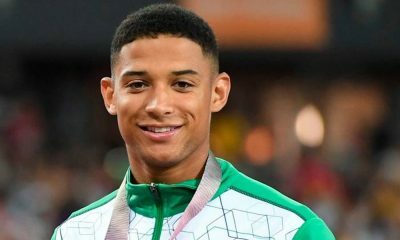 His 49.18 left him just two hundredths outside the medals as British Virgin Islands’ Kyron McMaster took gold in 48.25 ahead of Bahamas’ Jeffrey Gibson (49.10) and Jamaica’s Jaheel Hyde. 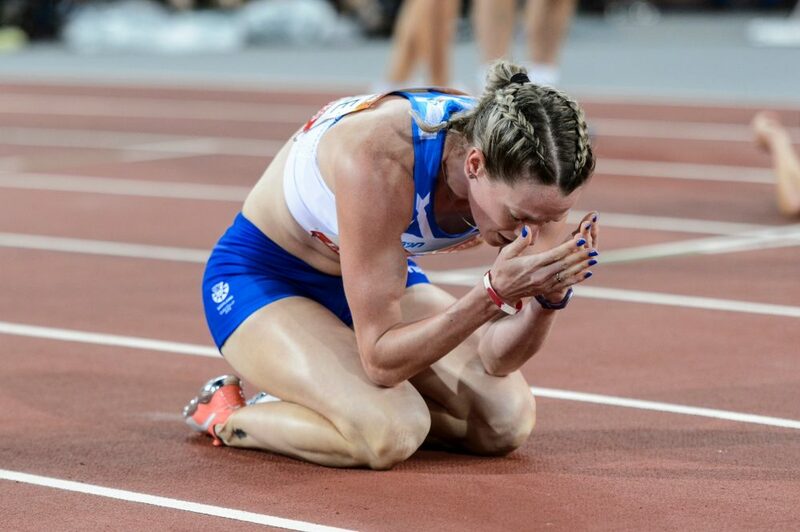 As Scotland’s medal hopeful Lynsey Sharp surprisingly failed to qualify for the final, England’s Alexandra Bell excelled with a PB to be the only home nations success in the 800m heats. Bell sliced 0.42 off her best with 2:00.11 as she placed behind only Caster Semenya, who looked easy in clocking 1:59.26. Both went through as automatic qualifiers. Shelayna Oskan-Clarke, who won world indoor bronze last month, ran a solid 2:00.81 but found this not enough to go through, crossing the line third in her semi. Northern Ireland’s Ciara Mageean was seventh in that race, running 2:03.30. Sharp, who won silver in Glasgow 2014, had felt she was in the shape of her life, but she could place only fourth in her race, running 2:01.33 behind Kenyan winner Emily Tuei and Uganda’s Winnie Nanyondo. In the 100m hurdles, England’s former world bronze medallist Tiffany Porter qualified automatically for the final, finishing third in her heat with 12.99 behind Jamaica’s Danielle Williams, whose 12.69 was the fastest of the round. In the other heat, England’s Alicia Barrett went through as a fastest loser as she was fourth in 13.19. However, Wales’ Caryl Granville failed to advance, finishing seventh in 13.98. In the 100m T12 for athletes with visual impairment, England’s Zachary Shaw and Wales’ James Ledger went out at the semi-final stage, running 11.58 and 11.77 respectively for second and third. South Africa’s Ndodomzi Ntutu took gold in the final in 11.02.